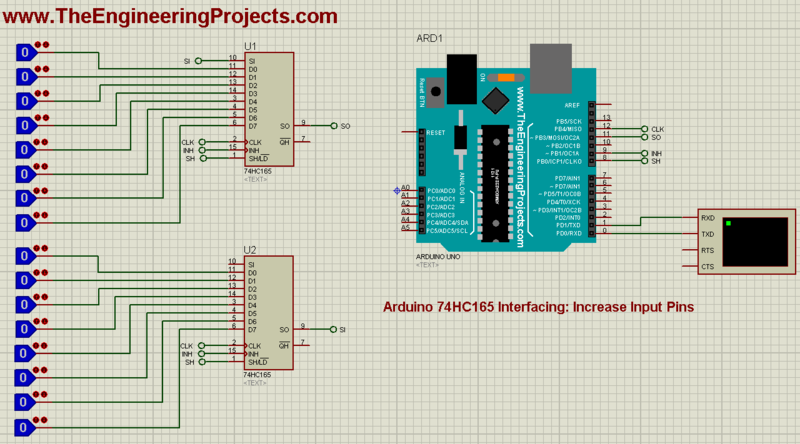 A complete step by step tutorial on Arduino 74HC165 Interfacing to Increase Input Pins. Hello friends, I hope you all are doing great. In today’s tutorial, I am going to do an Arduino 74HC165 Interfacing and we will have a look at How to increase Input Pins of Arduino. 74HC165 is a shift register and works on the principal of Parallel In Serial Out. In my previous tutorial Arduino 74HC595 Interfacing: Increase Output Pins, we have seen How to increase the output pins of Arduino and today we are gonna do exact the opposite and we will increase the input pins. I will design a Proteus Simulation of Arduino 74HC165 Interfacing, I have given the files for download at the end of this tutorial, but I would recommend you to design it so that you could learn. I will connect simple Logic buttons with this shift register and will read their status on the Serial Port. So, first of all design a simple Proteus Simulation as shown in below figure. I have used Arduino UNO and have connected Virtual Terminal so that we could have a look at Serial data. Pin # 8 of Arduino ==> Shift (SH) of shift register. Pin # 9 of Arduino ==> Clock Enable (CE) of shift register. 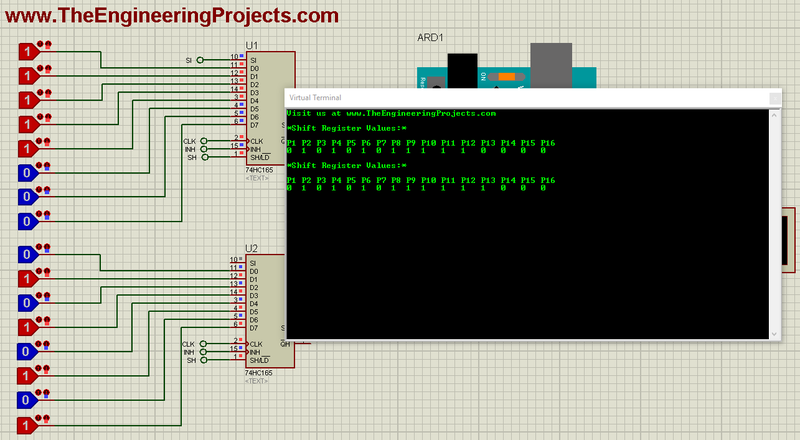 Pin # 11 of Arduino ==> Serial OUT (SO) of shift register. Pin # 12 of Arduino ==> Clock (CLK) of shift register. The code is quite simple but let me give you a quick explanation of it. First of all, I have assigned names to all 4 pins of 74HC165 connected with Arduino. Function read_shift_regs() is used to read the eight input pins of 74HC165 and print_byte() function is used to display that data on Serial Monitor. So get your hex file from Arduino software and upload it in Proteus software. If you change any input of your shift register then you will get the new value on your Virtual Terminal. Now let’s add another 74HC165 and increase our input pins by 16. Now, in the above code, simply change the first line and make #define NUMBER_OF_SHIFT_CHIPS 2. Simply changes 1 to 2, as we are using 2 shift registers now. Now get your hex file and run the Proteus simulation. That’s how you can easily interface multiple 74HC165 chips with your Arduino board and can increase the input options. this article is very informative and nicely explained.thanks for sharing….